Hello my name is Amy Martin and I am the project manager for Curious Sounds in Curious Spaces. My job is to work with the curators Fierce Festival and Symphony Hall in organising and coordinating this curious event which features over 28 artists and over 24 installations, interventions, screenings, workshops and performances that explore the different sounds of the Symphony Hall. Some of the activities actually encourage the audience to play the building like an instrument – strumming stairwells and drumming doorways. There is also some very curious spaces being used like the piano store where symphony hall usually keeps a very precious collection of grand pianos, the band rooms, dressing rooms, the loading bay plus a special tour behind the amazing 6000 pipe organ. It has been quite an undertaking and a real team effort to pull the event together which has tasked some of the UK’s most experimental sound and live artists in bringing these hidden spaces to life for one day only. One of the main challenges has been for the artists themselves because although Symphony Hall has experience of housing big productions, the shows themselves are already made and so are adapted to fit the concert venue. For this project many of the artists created completely new and site-specific work, which means that they fit their work into the dimensions and functionality of the building. To do this they have had to work closely with the operation and technical teams at Symphony Hall, studying floor plans and thinking creatively about how to get power to many of these unusual spaces. The other challenge we have faced is dress rehearsals and practises. As Symphony Hall is in use every day and nearly every night for concerts and gigs we won’t have a chance before the big day to have a dummy run! I guess that this contributes to the excitement of this amazing and truly unique event. It was really important to Fierce and Symphony Hall that the event is suitable for the whole family so it has been great to work with professional illustrator Lewes Herriot in creating the ‘look’ of the event. Lewes has created a series of mischievous monsters that each play with strange and curious instruments. Lewes has taken his illustrations from hearing stories about the mischievous monsters of Symphony Hall. Legend has it that these monsters live underneath Symphony Hall and come out at night to play together in a big curious concert. If you are ever up in the middle of the night and if you press your ear against the glass doors of Symphony Hall, you might hear them making strange plinky, plunky, buzzing, vibrating, crashes, bangs and toots that are very curious indeed. 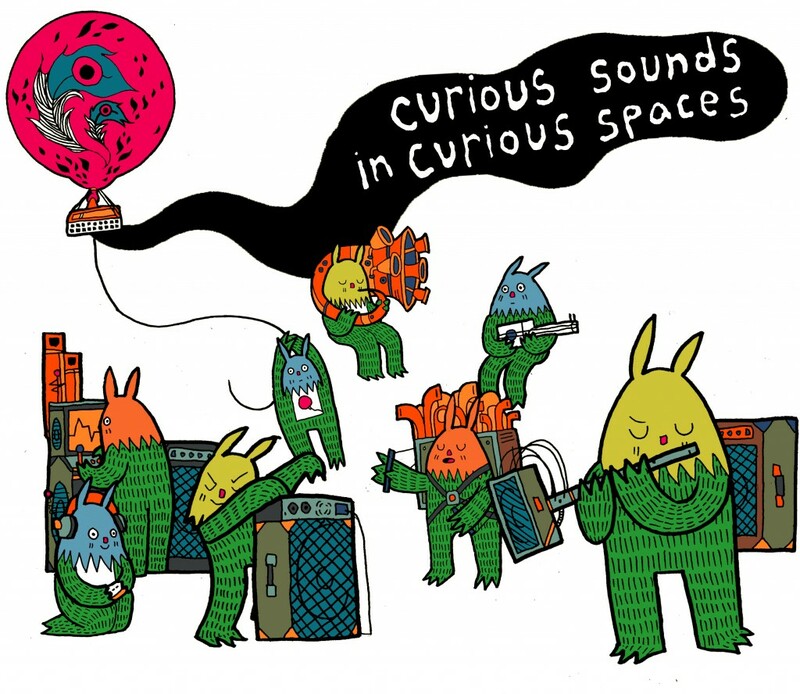 I am really looking forward to the Curious Sounds in Curious Spaces event on 7th April -Easter Saturday, there is something for everyone and plenty to do and all completely free! Bonus! For all the information check here to see some of the artists on our Tumblr here. Previous: Holy Mountain Party – Sat 31 March – full line up confirmed!